When the postal ballot arrived at his London home he looked at it and his heart sank. His application had been rejected. He collected his thoughts. There was no time to challenge the decision. He could not take that risk. The election contest in Fermanagh and South Tyrone was too finely balanced and the stakes to high. He checked flights out of London. They were cancelled. Iceland’s volcanic ash hung over the air space. Time was running out. He knew there was only one thing to do. He jumped on his motorbike and travelled to Holyhead in Wales and got the boat to Dublin and motorbiked to his home county of Fermanagh and voted in person for Michelle Gildernew. It is as well he did given that Michelle won the seat by the narrowest of margins - 4 votes. 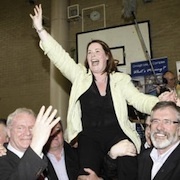 That loyalty to Michelle Gildernew is linked to a similar act of dedication during Bobby Sands’ election campaign. Among Bobby’s election workers there was great anxiety that a last minute act of sabotage could deprive him of winning the seat. The stakes were even higher then than now - Bobby’s life was on the line. Joe McConnell from Fermanagh had worked hard during Bobby’s campaign. He was determined to ensure that nothing would threaten the expressed wishes of the people of Fermanagh and South Tyrone. When all the ballot boxes were gathered and stored under lock and key overnight Joe slept on a chair outside the door. One look at Joe and you knew not to get on his wrong side. The ballot papers were safe under his watch. I waited at the Ballygawley roundabout 29 years ago. It was less than a week to polling day 1981. I was waiting for a cavalcade of Bobby Sands’ election workers. We were on our way to Enniskillen. The cavalcade arrived led by a huge single-decker bus painted cerise pink and dubbed the Pink Panther. This was our election ‘battle-bus’ long before they were fashionable. Among those on board were Bernadette McAliskey, Francis Molloy and Owen Carron - later to be elected MP when Bobby died. A few days before polling day 2010I was back at the Ballygawley roundabout. On this occasion I was waiting on the MP and minister for agriculture and rural development Michelle Gildernew. We were on our way to Enniskillen. As usual Michelle was relaxed, witty and confident of the result, so much so that she spoke about the content of her acceptance speech. Such confidence unnerved me but not her as she noted the names of SDLP families and unionist farmers who said they were voting for her. One woman told her that she did not vote for Bobby Sands but she would vote for Michelle so angry was she at SDLP leader Margaret Ritchie and candidate Fearghal McKinney. On the journey road signs flashed by awakening memories of Bobby’s campaign. Lisnaskea, where Gerry Adams and I met the late Noel Maguire, brother of recently deceased Frank, MP for the constituency, to convince him to withdraw his name from the contest and give Bobby a free run. Maguiresbridge where loyalists blew up and demolished the almost completed home of Owen Carron. The Ballygawley line where a poster war was waged between a UDR battalion and a battalion of Bobby’s posterers. The UDR took Bobby’s posters down and they were put back up immediately, the UDR lost. Enniskillen College where the historic announcement that Bobby had won was made against the backdrop of whoops of joy from Danny Morrison. To help Bobby, republicans came in from all over Ireland; they did the same for Michelle. Sean Lynch - Michelle’s election agent - said Alex Maskey’s withdrawal from South Belfast gave their campaign the vital lift it needed. Christopher, a I5-year-old canvasser, asked me to tell him what it was like during Bobby’s campaign. Others discussed the implications of winning and losing while a voice in the background directed streams of canvassers to doors. The atmosphere was electric. It felt like Bobby’s campaign. I sensed something big was happening. And not surprisingly the people of Fermanagh and South Tyrone were as loyal to Michelle Gildernew MP as they were to Bobby Sands MP.